Nam Sang Wai and Lut Chau are in Yuen Long in northwest New Territories. Nam Sang Wai is bordered by the Shan Pui River to the west, the Kam Tin River and Kam Tin Main Drainage Channel to the south and east respectively. The smaller Lut Chau site is surrounded by intertidal and mangrove creeks, adjacent to Mai Po Nature Reserve to the north. The Fairview Park residential development is about 300m from Lut Chau. 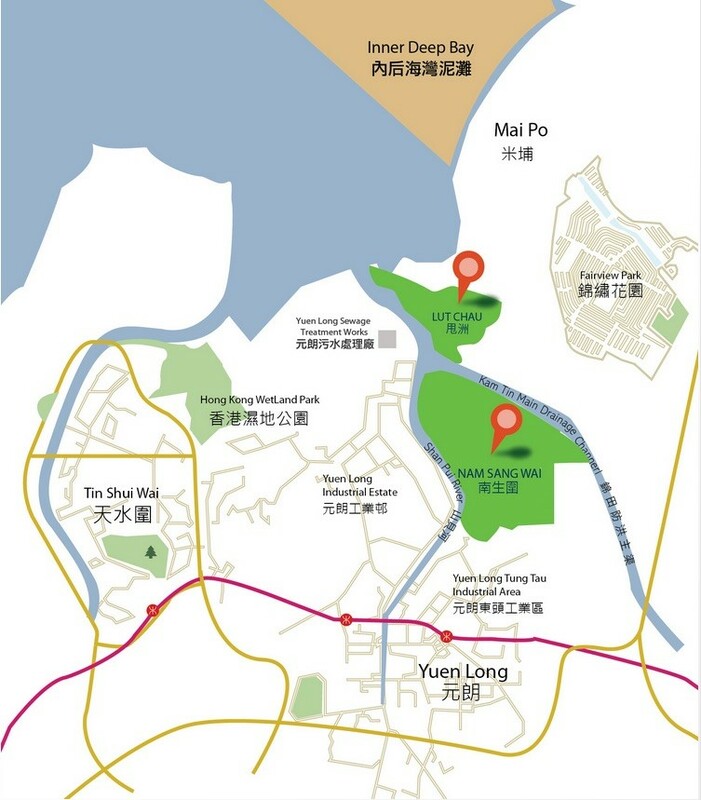 Across the Shan Pui River from Nam Sang Wai lays the Yuen Long Industrial Estate and the Yuen Long Sewage Treatment Works. The Kam Tin River to the south separates the site from Shan Pui Village, and Yuen Long New Town and Yuen Long Industrial Area are further to the south. Nam Sang Wai can be easily reached by car along the maintenance road of the drainage channel. The best starting point for a visit to Nam Sang Wai is the Hung Mo Kiu on Castle Peak Road, via a short bus journey from the LRT station at Sun Yuen Long Centre.